During the years I have practiced mindfulness meditation, I have learned that regular meditation provides multiple benefits to my health. In addition to improving sleep and reducing blood pressure and heart disease risk, meditation will also relieve pain, reduce anxiety, and ameliorate depression. My patients who meditate require less medication, experience greater satisfaction in psychotherapy, and find other issues like addiction and substance abuse are easier to overcome. In one study conducted at the Wake Forest Baptist Medical Centre in North Carolina, scientists found that doing meditation daily for a few minutes could relieve pain better than a powerful pain relieving medication. What is meditation? If you've followed my blog here (or if you browse earlier posts) you know that my approach to meditation is quite simple and straightforward. Although I have studied theology and philosophy seriously, including the great religions, I do not see meditation through the lens of religion. Like contemplative prayer, however, meditation has the capacity to soothe, calm, and relax the mind, and the most challenging aspect of meditation is simply to practice on a daily basis. Meditation is the simple practice of making the mind calm, and silent, and bringing your thoughts to one point. In other words, meditation can be defined as making mind free from agitation, turning attention away from distracting thoughts and focusing on the present moment. Some individuals incorporate meditation as part of religious practice, and others do not. Yoga, for example, is one approach to meditation that has spiritual roots, and the same is true of contemplative prayer in Christian and Jewish traditions. Zen meditation, deriving from Buddhism, also has spiritual aspects. Christian writer Phil Fox Rose says, "The promise of a devoted spiritual life, of which meditation is an invaluable part, is serenity...that in everyday life you will not be anxious, restless or irritable; and that in good times you will be fully alive to enjoy them." After practicing meditation for even a few weeks, what many people notice is that mindfulness becomes a part of everyday life. In other words, we become more mindful in every activity. We focus more clearly, we think and speak more in terms of the present moment, and we act with greater compassion and clarity. Meditation produces many benefits. I have noticed that my meditation practice improves concentration, strengthens the mind and leads to multiple health benefits: lowering blood pressure, reducing emotional distress , diminishing anxiety attacks, and improving my relationships. The Wake Forest study now shows that meditation each day could be better in relieving pain than taking morphine. Similar studies at Duke and Harvard point to similar findings. In their study, the lead researcher, Dr. Fadel, examined the brain scans of individuals who had been trained to use relaxation and breathing techniques to cope with the pain. After studying the brain scans, his team noticed that the study subjects who meditated regularly had calmer brain scans. They saw a 27 percent reduction in pain intensity and 44 percent less emotional pain in group of volunteers who actually practiced mindfulness meditation. Along with many others, I believe that such findings prove that mindfulness meditation can produce different patterns of brain activity to suppress the feeling of pain. Based on the study results, the scientists believe 20-minute a day meditation practice could be added to conventional pain relief methods for better and quicker relief. The study focused on volunteers who were pain free, so the question remains as to whether individuals with more serious pain problems can achieve similar results. The study findings are reported in the Journal of Neuroscience. Another study from the Department of Psychiatry at Duke University Medical Center shows that mindfulness meditation can protect against depression. There are now hundreds of scientific papers on mindfulness. A Harvard Medical School study showed promising results in pain relief: "Recently, it has been demonstrated that pain can also be attenuated by mindfulness….Mindfulness practitioners and controls received unpleasant electric stimuli in the functional magnetic resonance imaging scanner during a mindfulness and a control condition. Mindfulness practitioners, but not controls, were able to reduce pain unpleasantness by 22% and anticipatory anxiety by 29% during a mindful state." Let me know if you discover new findings in this exciting area of research! Dan Harris makes a really good point in this article from Mindfulness, one of my favorite journals. I've been practicing mindfulness for almost 30 years, and I've found the discipline extremely helpful. I'm a bit shy, however, in urging others to investigate mindfulness practice. Like many other fields of study (nutrition, psychology, education, psychiatry, religion, etc.) there are about as many ideas out there as there are people. Go to dinner with four or five fitness instructors or yoga practitioners from different "schools" and your hair may catch on fire. So it is with discussions of meditation and mindfulness. Mindfulness is not simply sitting still in a chair with your eyes closed, nor is it necessarily connected with religion, although all sacred traditions are associated with the value of contemplative life, periods of silence, and centering prayer. Mindfulness is an experience, not a theory or an idea or concept. Mindfulness happens within ourselves, within the mind or—as some would say—within the spirit. Whatever we choose to call the experience, or however we define it, science clearly shows the benefit of mindfulness practices. 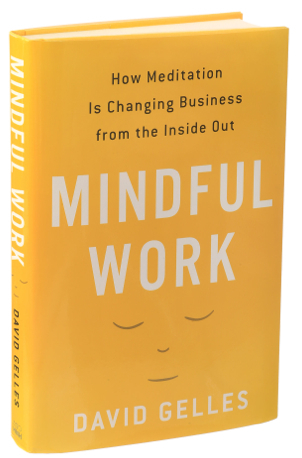 In his book Mindful Work, David Gelles (New York Times reporter) makes a good case for mindfulness: "One of the most surprising and promising trends in business today is the rise of mindfulness in the workplace. At first, the notion of yoga and meditation in the office seems like the province of Silicon Valley startups where employees bring their dogs to work and play football in the lobby. But in recent years, mindfulness has gone mainstream. Many of America’s largest companies, such as General Mills, Target, Google, and Aetna, have built extensive programs to foster mindful practices among their workers. This is because—as employees and employers are discovering, and psychologists and cognitive scientists have confirmed—mindfulness has tangible benefits. For workers, meditation lowers stress, increases mental focus, and alleviates depression. For companies, a more mindful workforce is more productive." Nobody loves a noodge who is intent on telling you what’s wrong with you and what you have to do to fix it. While you may feel that someone who is telling you how stressed out they are would benefit from meditation, it’s better to bide your time and let them ask you about it. Resist the urge to gush about your new favorite thing. An exception: There’s nothing wrong with suggesting it to your employer. It’s not as awkward to bring it up in an organizational context. You’re not really imposing on anyone. You can talk about the science, about how lots of successful organizations are using it (See David Gelles’ Mindful Work), and suggest someone to contact. If possible, it’s good to note that any successful mindfulness program must be voluntary. Lots of people have picked up the truly crazy idea that meditation somehow vacuums out your head and makes you into a brainless zombie. Let people know that it’s about focusing the mind, not blanking it out. Emphasize that it’s an inherent, innate ability, a skill, not a gauzy, zoned-out place to drift off to. People are naturally afraid to take on yet another self-improvement project to feel guilty about. Their life probably has a few exercise machines they’re not using, books they’re not reading, and club memberships going unused. Let them know that there are lots of ways to fit meditation into their existing life, and that it might actually help them use time better. There’s no point in blathering on about how simple and easy it is, because if someone tries it for even five minutes, one of their first thoughts will be, “I cannot do this.” Staying with your breath in the moment can just seem impossible. Let people know this, but let them know it does get better. There’s a great New Yorker cartoon where a woman tells her lunch companion, “I’ve only been gluten-free for a week, but I’m already really annoying.” The essence of proselytizing and preaching is talking at, not with, someone. It’s important to hear what someone has to say and be ready to learn. It also sends the authentic message that mindfulness is about being continually curious about the mind—your own and everyone else’s. When you talk about the nattering voice in the head, you get right into the heart of people’s internal lives, which they may or may not have considered before. If you point out that most of our internal dialogue is negative and self-referential, most people will recognize that in themselves. The notion of having a tool to better manage that will seem appealing. Find a good spot in your home or apartment, ideally where there isn’t too much clutter and you can find some quiet. Leave the lights on or sit in natural light. You can even sit outside if you like, but choose a place with little distraction. At the outset, it helps to set an amount of time you’re going to “practice” for. Otherwise, you may obsess about deciding when to stop. If you’re just beginning, it can help to choose a short time, such as five or ten minutes. Eventually you can build up to twice as long, then maybe up to 45 minutes or an hour. Use a kitchen timer or the timer on your phone. Many people do a session in the morning and in the evening, or one or the other. If you feel your life is busy and you have little time, doing some is better than doing none. When you get a little space and time, you can do a bit more. Take good posture (see instructions above with actor Sandra Oh above) in a chair or on some kind of cushion on the floor. It could be a blanket and a pillow, although there are many good cushions available that will last you a lifetime of practice. You may sit in a chair with your feet on the floor, loosely cross-legged, in lotus posture, kneeling—all are fine. Just make sure you are stable and erect. If the constraints of your body prevent you from sitting erect, find a position you can stay in for a while. When your posture is established, feel your breath—or some say “follow” it—as it goes out and as it goes in. (Some versions of the practice put more emphasis on the outbreath, and for the inbreath you simply leave a spacious pause.) Inevitably, your attention will leave the breath and wander to other places. When you get around to noticing this—in a few seconds, a minute, five minutes—return your attention to the breath. Don’t bother judging yourself or obsessing over the content of the thoughts. Come back. You go away, you come back. That’s the practice. It’s often been said that it’s very simple, but it’s not necessarily easy. The work is to just keep doing it. Results will accrue. Check out the Media Page for some of my favorite videos, including Jon Kabat-Zinn on mindfulness, Martin Seligman on positive psychology, David Tolin on pseudoscience, and a special appearance by my new friend, "The Monk Dude," who meditates while playing the guitar. Old 12-Steppers will surely enjoy Richard Rohr's talk, "Breathing Under Water."